Listening Library, 2017. 12 hours, 41 minutes on 10 compact discs. Ah! Another chance to enjoy the fifth and final book in the Lockwood & Co. series! Yes, listening to the book on CD is even more fun than reading it yourself. I still say that these books make outstanding family listening – once your children are old enough to handle some seriously spooky events as well as people seriously trying to murder our heroes besides the incidental life-or-death danger they face routinely. For the plot, I refer you to my review of the written book. I’m here to say that the audiobooks make them even more enjoyable – though it’s hard to believe that’s even possible, because they’re so good in the first place. I have liked my approach to the whole series – devour each book as quickly as possible as soon as it comes out. Then, when I can get my hands on the audiobook, enjoy it again, savoring it a bit more slowly and catching some details I didn’t notice the first time. Amulet Books, 2016. 335 pages. 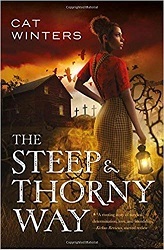 The Steep and Thorny Way is a reimagining of Hamlet in 1920s Oregon. Hanalee Denny has white mother and an African American father, so she’s not very welcome in their town, where it’s illegal even for her parents to be married. But her father died two years ago, hit by a teenage drunk driver, and her mother has remarried to the doctor who comforted her after her husband’s death. Now Joe, the teen who hit her father, is out of jail for good behavior, but he’s hiding out, because some people are after him. But Hanalee talks to him. He tells her that her father only had a broken leg after being hit by the car, and the doctor who’s now her stepfather must have killed him. What’s more, Hanalee learns that her father’s ghost has been seen on the highway at the crossroads where he was hit. Perhaps she can talk to his spirit and find out what really happened. Okay, so far I thought we were going to get a straight retelling of Hamlet, so I thought I knew what was going to happen. But there are many twists and turns in this story. Things get sinister when we learn that the Ku Klux Klan is active in their town. They’re recruiting young people, and even Hanalee’s childhood friend is turning against her. And they have reasons for wanting Joe out of the picture as well. So you’ve got a mystery – how did her father actually die? You’ve also got peril unfolding as Hanalee tries to get to the bottom of the mystery. And there are plenty of historical details about Oregon in that time period. Reading about someone who’s made to feel “other” is a good antidote to bigotry. I hope this book isn’t as timely as it seems. Delacorte Press, 2016. 278 pages. I woke up dead. At the mall. Still dressed in the (hideous) mango chiffon bridesmaid gown I was wearing when I died. My hair was still pulled back in an elaborate ponytail that was meant to look windswept, but trust me, it would have survived a tsunami. This proves that if you use enough product, your hair can endure things the rest of you can’t. My shoes sparkled in the light. My French manicure was unchipped. I was surrounded by waves and waves of mango chiffon. Isn’t this perfect? I had actually kept my mouth shut, opting not to tell the bride that I’d never be caught dead in mango. Now here I was. Dead. In mango. It turns out that the place where Sarah woke up dead is the Mall of America in Minnesota. She was from New York City. Most of the people can’t see her, but then she meets Bertha, her Death Coach. Bertha informs Sarah that she was murdered. (How can this be? Sarah didn’t know enough people to have enemies.) 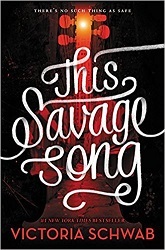 Bertha puts Sarah into a support group with other murdered teens from New York who need to move on. If they don’t move on, they’ll become mall walkers, walking through the mall reliving their deaths. The teens in the group, one of whom is amazingly attractive, get to visit their own funerals and one day out of their past lives. All with the hope that this will help them let go and move on. But when Sarah learns who killed her and that her father is in danger, she doesn’t want to move on without helping her father first. That little problem of falling in love isn’t going to help her move on, either. Do I have to mention that I don’t think for a moment any of this will happen after anyone dies? Do I have to mention I don’t agree with the theology here? But this is a tremendously fun novel. I binge-read it in one sitting and enjoyed myself greatly. There’s mystery – who killed Sarah? There are fun characters and creative world-building. (How does this whole death thing work?) The characters are great, and they all have interesting back stories (which ended up getting them killed). 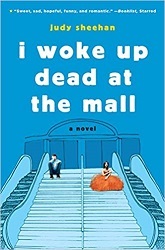 This is a fun read that leaves you smiling – about death. Sure, maybe you’ll think a little harder about how you live your life. But mostly you’ll enjoy watching a good kid named Sarah navigate a difficult and unfamiliar situation by not necessarily following the rules, but doing the best she can. Amulet Books (Abrams), 2016. 327 pages. 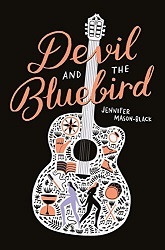 Blue Riley goes to a crossroads at midnight to make a deal with the devil. She wants to find her sister, who walked out two years ago. She’s pretty sure her sister made her own deal. She meets there a lady in a red dress, who does make a deal. Blue tries to trade her soul for her sister’s. But instead the lady offers her a game. The lady gives Blue six months to find Cass, and she even gives her a homing device — enchants her boots to tell her the right direction. And the terms get harder as she goes on the road. If someone she meets learns her name, then Blue can only stay with them for three days — or it will be bad for them. If they don’t know her name, Blue can stay with them for three weeks. Blue sets out with $900, her guitar, and a notebook and pencil for trying to communicate. Magic realism is not my thing, so this story isn’t something I’m naturally drawn to. It ends up partly as a catalog of the dangers that homeless people face. Not that it comes across as dry like a catalog — you care deeply about each one. But it’s also an exploration of family and music and success — and what people are willing to give up to find success. Or fake success. And what it means to be who you truly are. Source: This review is based on a book sent to me by the publisher. HarperAudio, 2016. 13.75 hours on 11 discs. I’ve already reviewed this book in print form, but oh, Katherine Kellgren’s performance makes it so much fun! 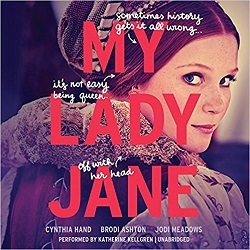 We’ve got alternate history England, featuring Lady Jane Grey, who was queen for nine days. In this version, many people have the magic power to turn into an animal. In the course of things, Jane finds out she is one, which is how she escapes losing her head. 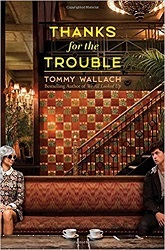 The story is funny and clever and twists history just enough to be terribly fun. And Katherine Kellgren’s brilliant vocal abilities are perfect to bring out all the humor in the situations. By now, I’ve become Katherine Kellgren’s fan. In a story set in England that was already outstanding in an over-the-top humorous sort of way, her performance puts it even more over the top. Now when I recommend this book, I’m going to suggest listening. Simon & Schuster, 2016. 276 pages. This book opens as Parker Santé is in a hotel, looking for something to steal. He sees a girl with silver hair pay for her coffee. She reached into her purse and pulled out the fattest stack of hundreds I’d ever seen in real life. I’m talking a hip-hop video kind of wad, thick as a John Grisham paperback. She peeled off one of the bills — (I see you, Mr. Franklin) — and handed it over. “Keep the change,” she said. The waiter nodded a stunned little bobblehead nod, then peeled out before the girl could think better of her generosity, leaving her to tap idly at the top of a soft-boiled egg in an elaborate silver eggcup. I stared at her staring off into space, and counted the many ways in which she was incredible. He’s attracted to the girl, but that doesn’t stop him from stealing the wad of cash when she leaves her purse behind. However, he makes a fundamental mistake, a mistake that reminds him of the myth of Orpheus. But my dad said it was the most perfect myth ever written, because it represented the most fundamental human error: we all look back. When I did, I saw that the silver-haired girl had returned to her seat. In spite of the fact that her purse was open and half its contents had spilled out across the tablecloth, she wasn’t screaming or crying or scrambling around, looking for the culprit. Why, you ask? Because she’d been distracted by something else. By what, you ask? Well, by my journal, of course! I’d left it behind when I tore off with all that money. It had my name in it, and my e-mail address, and an incredibly embarrassing story I’d recently written called “The Most Beautiful Girl in the Kingdom,” which she was now reading. They get to talking. Or, I should say, the girl talks and Parker writes. Parker hasn’t been able to talk since the accident when his dad died. Parker doesn’t like the sound of that. So he negotiates. He thinks he’s talking her out of jumping off the bridge, but they end up with the deal that she’s going to spend all that money on him (and with him), and he is going to apply to and attend college. As their adventure takes off, they get to know each other better. When Parker tries to find out more about Zelda, she tells him that she was born in 1770 in Kassel, Germany. She doesn’t age. Now her second husband is dying of old age, and she’s had enough. But whether or not he believes her, Parker has some things to show her about life. And she has many things to teach Parker. I like all the questions this book opens up. What would it be like not to age? What would you do? I wasn’t crazy about the framing — It’s supposedly Parker’s college application essay. I didn’t actually believe you’d be able to submit a book-length manuscript online. Though that does add to the fun because you don’t know if it really happened to the character. Though it certainly supports how dramatically his life changed. An entertaining book that you can think about for a very long time. Bloomsbury, New York, 2015. 358 pages. 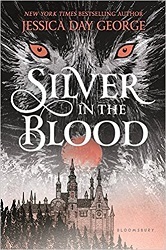 Set in 1897, this is a historical fantasy romance about two cousins who are being sent from New York to Bucharest, Romania, to meet and learn the truth about their mother’s family. By the time the girls do find out what the Wing, the Claw, and the Smoke are, we are not at all surprised. I can’t help but wonder if it would have given the book more momentum if it had started when they arrived in Bucharest, rather than during their separate journeys there. There’s some build-up to the revelation of the family’s magic that falls a bit flat by the time we discover what it is. We do end up with an interesting situation. Two young ladies ready for New York society suddenly discover magical powers and that their powerful family is part of a prophecy – and a political plot. They must decide which side they are on. The timing of the story fits with the publication of the book Dracula and the girls meet Prince Mihai, a descendant of the famous count. Their family has always served the Dracul family. Prince Mihai intends that they continue to do so. This book is a historical novel for teens who like regency fiction with dances and gowns and society – combined with a twist of magic and political intrigue. The exotic setting of the Romania of 1897 adds to the fun. Will’s brother Shawn just got shot. And Will is sure he knows who did it. No crying, no matter what. No snitching, no matter what. So Will takes Shawn’s gun and sets out to kill the person who killed him. He gets in the elevator on the 8th floor. And on each remaining floor someone new gets on… someone who’s dead. The first dead person in the elevator is Buck – a brother even older than Shawn. He knew the Rules, too, and taught them to Shawn. In fact most of the people who show up on this elevator lived by the Rules. The thing is: They’re dead now. This is a novel in verse (and artistic, well-crafted verse), so it’s quick reading. It does pack a punch. 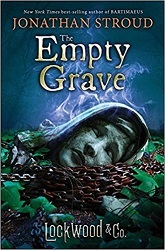 I finished The Empty Grave today, and with it the entire Lockwood & Co. series – and Yes! The series ends well. I can now officially say that from start to finish, this is one of the best children’s book series ever. These books make good family reading, since adults will enjoy them every bit as much. Children need to be old enough to be able to not be afraid of all the murderous ghosts (and murderous people). If your child doesn’t mind some severe spookiness, I highly recommend this series. This series deals with an alternate reality England where there’s a “Problem” with ghosts roaming the countryside and haunting buildings and places where they died. These aren’t friendly ghosts – if they touch you, you’ll die. And only children can see them. Lucy, Lockwood, George, and Holly still have their independent agency for dealing with ghosts – but powerful forces are ready to put them out of business – or perhaps simply kill them. In this final installment, all the threads come together. Can the smallest agency in London expose what’s at the root of the Problem? Or will they be silenced? We’re told at the beginning of this book that Lucy survives. But will any of her friends survive with her? I really mustn’t say any more about the plot. Yes, this is a series you should read from the beginning – It’s brilliantly crafted, with important pieces revealed at just the right time. 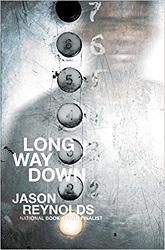 In this book, it all comes together in a satisfying, and very suspenseful, way. 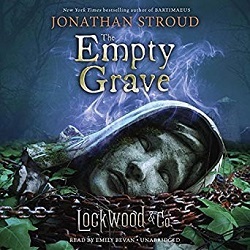 Jonathan Stroud’s Bartimaeus series is brilliant – but Lockwood & Co. goes far beyond it. You come to care about all the characters deeply (even George!) and to understand the complex situation and all that’s at stake. This series is magnificent! Read it! Source: This review is based on my own copy, preordered via Amazon.com.